2011 intern Kimmy McCormack's (left) internship project focused on developing receiver functions for seismic stations along the Ryukyu arc in southeastern Japan. The goal of the project was to attempt to determine whether any serpentinization has occurred in the upper mantle of the subduction zone. 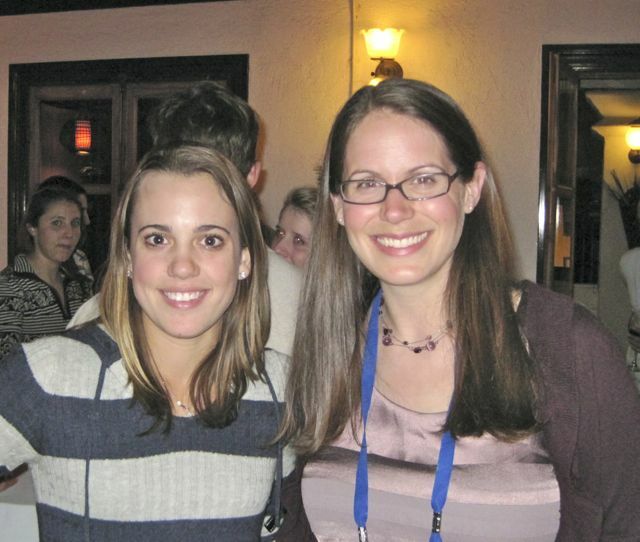 During the summer she received guidance from her mentors at Yale University; Maureen Long (right) and graduate student Erin Wirth (not pictured). Her summer's work concluded with a poster at the 2011 Fall AGU meeting. After AGU, Kimmy continued to pursue the project with her mentors while completing her senior academic year. The effort certainly has paid off as the results warranted development into a publication. McCormack, K., E. A. Wirth, and M. D. Long (2013), B-type olivine fabric and mantle wedge serpentinization beneath the Ryukyu arc, Geophys. Res. Lett., 40, doi:10.1002/grl.50369. Kimmy has recently graduated from the University of South Carolina where she has had a stand out academic and atheletic career. This fall she will be transitioning to the PhD program at the University of Texas, Austin. There she will work with Dr. Marc Hesse on porous media research and numerical modeling.